There are a lot of presents I can’t show you. However, there’s one that I can, as long as you don’t tell any 7 year olds about it. It’s what all the well dressed Minions will be wearing this year. 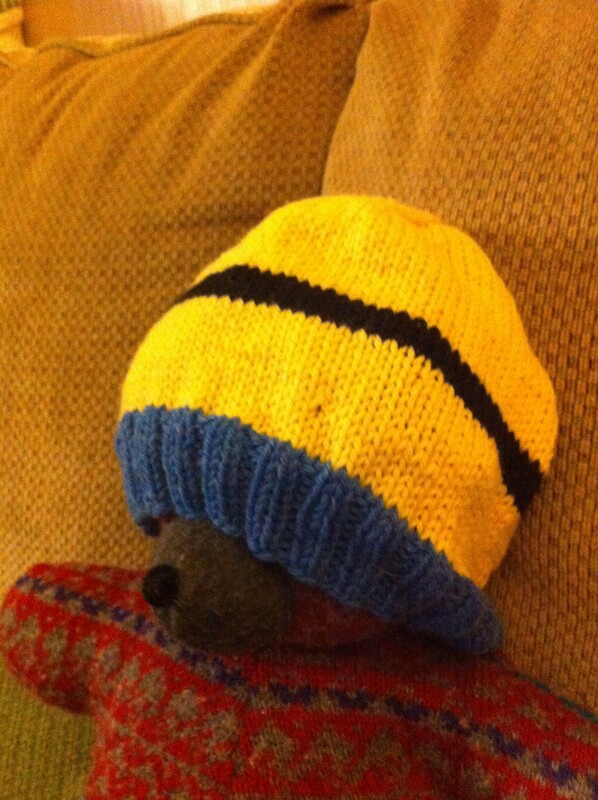 I still have to crochet the goggles, but that shouldn’t take too long. If you haven’t seen Despicable Me or Despicable Me 2, then you don’t have any idea what I’m talking about. Run out, get the movie and when you’re done giggling hysterically over the antics of the Minions, then come back here. This particular 7 year old has already decided that she is going to be a Minion for Halloween. Next year. And perhaps the year after that. And maybe most weekends up until then. Nothing makes this little girl giggle like the small yellow creatures that say, “ba-na-na.” Case in point, she got some Minion stickers from her teacher as a reward and went around saying, “Momma, I’m one in a Minion! Get it?” I think it’s going to be a hit. I very roughly followed the pattern from Hand Me Down Hobby. I used Cascade 220 for its durability and it’s reasonable price. I’ll have a lot of yarn left and I’m debating whether to make Minion slippers or just make some baby hats to donate after Christmas. i did a bunch (15) of these and used a knitted eye with an attached i-cord to make the goggles. found a free pattern on ravelery that had both a knit and a crocheted version. they wanted earflaps so had to cobble together a couple of patterns……….. Thanks Carol! I hadn’t thought of using an attached I-cord. I ended up crocheting the eye, I will definitely post photos.